The University of Lynchburg Choral Union and Opera on the James Tyler Young Artists will present a joint concert, “A Celebration of Opera,” on Saturday, October 18, at 7:30 p.m. in Snidow Chapel. Dr. Jong Kim, LC professor of music and program director of the MA in Music Program, will conduct with Tom Getty and Rose Peak accompanying the concert. The concert will feature choruses and arias from beloved operas and will benefit the Lynchburg Branch of the Blue Ridge Area Food Bank. Admission to the performance will be a donation of cash or at least five non-perishable food items. On Sunday, October 19, the concert will be repeated at 3 p.m. in the Buchanan Theatre, in Buchanan, Va. This performance is partially sponsored by the Bank of Botetourt. The LC Choral Union is an auditioned choral ensemble that performs choral masterworks. The group is composed of University of Lynchburg, students, faculty, staff, alumni and community singers. 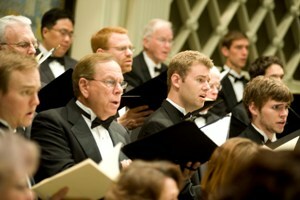 The Choral Union presents Handel’s Messiah annually in early December. The Tyler Young Artist Program is quartet of singers chosen through national auditions, who perform the majority of the Opera on the James community programs. Young Artists have generally completed a master’s of post-grad certificate in opera performance and have some experience with regional companies or other training programs outside of academia.